The effect of the sun on the earth atmosphere has been a base for many interesting studies by scientists around the world. Many atmospheric conditions are contributed to the solar activities. After all it is not just the sunlight that gets to the earth. Our planet is also being affected by electromagnetic waves, gravitational forces and other radiations from the sun. Scientists have tried to find a relation between solar activities and atmospheric events on earth. Earthquakes, volcanoes, auroras, sudden changes in temperature are among the events that are being studied for their relation with solar activities. Electromagnetic nature of radio waves make them susceptible to many weather phenomena including the electromagnetic activities of the sun. 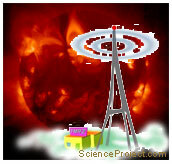 In this project we plan to find out how solar activities affect the propagation of radio waves. More details or support for this project is available for the members of ScienceProject.com. Material needed for experiment may be found at home, obtained locally or purchased online.